When it comes to mushrooms, Ryan Bouchard and Emily Schmidt are much more than “belly hunters.” Sure, the 130 types of wild mushrooms the Wakefield, R.I., couple has cooked with were all delicious, but they consider southern New England’s population of umbrella-shaped fungi more than culinary enhancers. They didn’t create their start-up enterprise, Southern New England Mushroom Hunting, or publish a book/2015 calendar titled “Gourmet Mushrooms of Rhode Island” to rid the region of edible fungi. In fact, they are more concerned with educating people about the species’ role as pollution filters and ecosystem builders. They deliver this mushroom message by focusing on their deliciousness. That’s why Schmidt, besides focusing on the nutritional value and health benefits of mushrooms, spends plenty of time studying the species’ ecological importance, most notably as a means to degrade contaminants. She is intrigued by mycoremediation — a form of bioremediation, the process of using fungi to deconstruct environmental contaminants. Some fungi are capable of absorbing and concentrating heavy metals in the mushroom fruit bodies. Bouchard and Schmidt got much of their passion for and interest in mushrooms from the Audubon Society of Rhode Island’s Joe Metzen and fellow Rhode Islander Josh Hutchins, who has studied the species in Maine. They also ascribe to Paul Stamets’ view of the mushroom. Stamets, a mycologist with four decades of experience, is the founder and president of Fungi Perfecti. Southern New England Mushroom Hunting offers lecture/slideshow classes, guided walks, cooking demonstrations and private lessons. The couple routinely gives presentations at public libraries. “Gourmet Mushrooms of Rhode Island” is loaded with mushroom photographs, pages of information about the edible and inedible varieties and 12 months of 2015. Bouchard wrote the text and took most of the photos, with Schmidt providing the rest. Bouchard said a person can making a living picking wild mushrooms in Maine and on the West Coast, but for most southern New England hunters, such as Schmidt and himself, it’s more of a hobby. 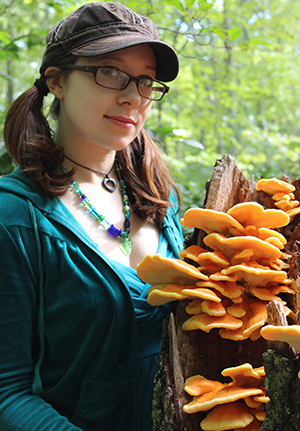 Both Bouchard and Schmidt said chicken of the woods, hen of the woods, lion’s mane and black trumpets are the choicest wild mushroom varieties they have discovered. They warn prospective hunters to be prepared for funny looks from hikers, dog walkers and joggers when they’re out searching for wild mushrooms. More importantly, they note that many poisonous and deadly wild mushrooms look at lot like the delicious ones. To successfully find wild mushrooms, Schmidt said it takes planning, being a keen observer of nature, keeping track of the weather and understanding forest types.